"Match 3" games are a dime a dozen, but Namco’s Pac-Match Party—a celebration of Pac-Man's 30th birthday—manages to stand out by creating a refreshing mix of intuitive and addictive gameplay centered around Pac-Man’s iconic imagery. Pac-Match party has plenty of cute moments, but also some really intense gameplay. When you launch the app and start a new game, the screen fills up with brightly colored Pac-Man ghosts and a host of other little goodies, from cherries to cakes to birthday presents. Tap and slide to switch the icons’ positions and make chains of at least three. This will clear the group and new icons will slide in. Sounds pretty standard so far, right? 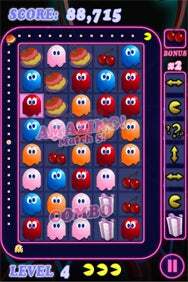 But around the outside of the game board, a Pac-Man progresses in a modified maze every time you make a match. If you don’t move fast enough, the ghosts will catch up with you and use up your lives until it’s game over. The more matches you make, the more time Pac-Man has to escape. Long chains and other advanced combinations will drop extra power-ups like strawberries and peaches onto the screen, which you have to tap before they turn back into regular icons. “Gifts” show up on the side for you to use at your convenience, like a cherry bomb that knocks out a block of icons for major points. The game is as simple as can be and goes on for as long as you can keep up. I reached about 1.5 million points in just a couple hours. The best part is that your progress is saved even if you have to exit suddenly. In theory you could keep a game going for weeks if you felt like it and had the lives left. A leaderboard stores your high scores while a list of unlockable achievements gauges your matching prowess. The “Rules” button on the home screen lays out each power-up’s features and the points they carry, should you need clarification. Bottom line: if you like puzzle games and Pac-Man, this is pretty much your Holy Grail. It’ll be two of the best dollars you ever spend in the App Store.